To find a file select [Command\Find file - Alt+F7]. The results are saved. To view the results of the last search press Ctrl+S or select The results of the last search in List of the toolbar. To find *.ico only activate the checkbox Strict search on the Advanced page. ??? To find a file with the same name on the opposite panel press [Command\Find on the other panel - Alt+Q]. 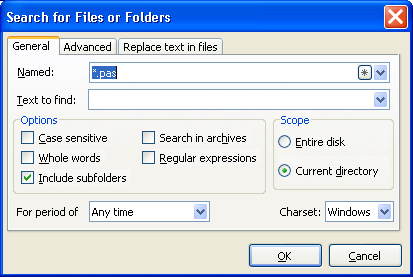 Besides using this option you can find out if there is this file in the folder.